Attending an event at Canada House to celebrate the 150th anniversary of Canada's confederation today, The Queen added another brooch to her collection to celebrate her own milestone anniversary. The Governor-General of Canada, David Johnston, presented The Queen with the Sapphire Jubilee Snowflake Brooch from Canada. The brooch recognizes Her Majesty's Sapphire Jubilee in 2017, marking 65 years on the throne. Appropriately, it does so with sapphire stones. 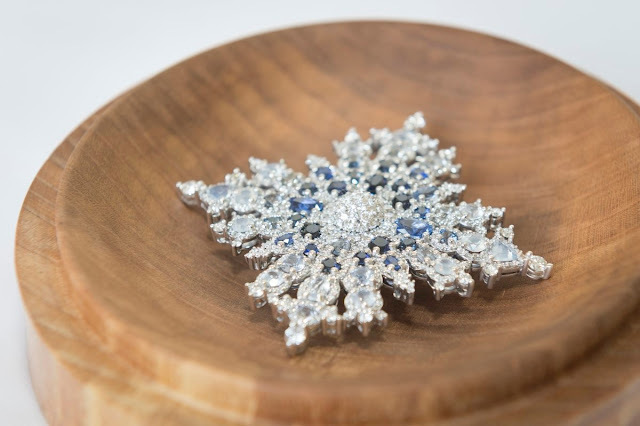 The sapphires contained in the brooch come from a deposit of sapphires discovered in 2002 on near Kimmirut on Baffin Island by brothers Seemeega and Nowdluk Aqpik. Coming from Canada's only known deposit of sapphires, these Beluga sapphires are stones that have a natural blue color that does not require heat to enhance. 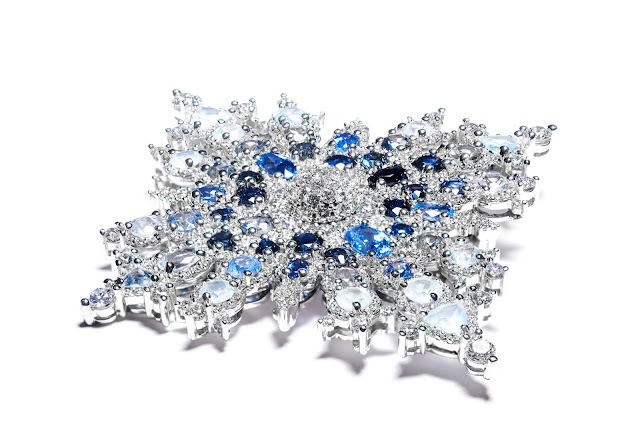 The brooch includes 48 sapphires of varying sizes, shapes, and colors, weighing 10.19 carats in total. The blue stones are arranged with the darkest blue colors at the center, surrounding a diamond dome. 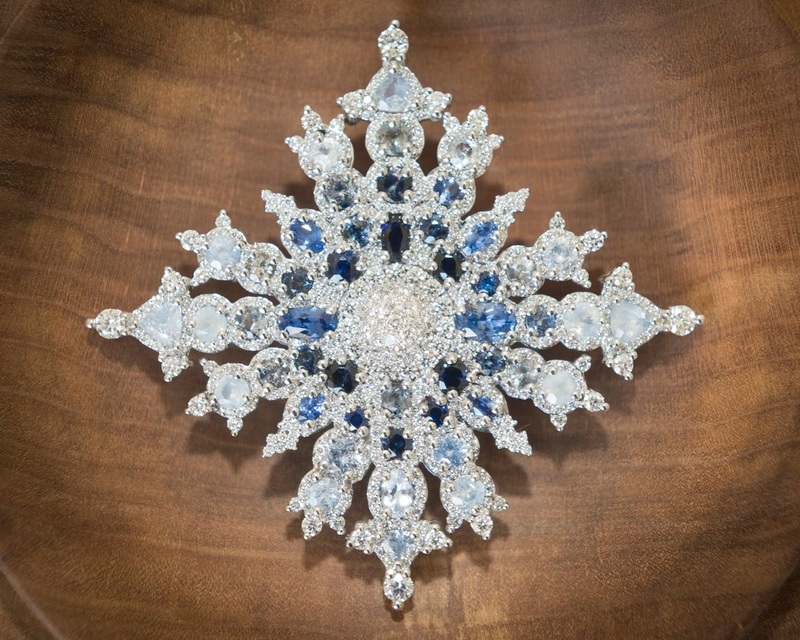 The sapphires fade into lighter colors as they approach the edge of the brooch, creating an ombré effect. The stones are surrounded by more than 400 diamonds from northern Canada, weighing 4.39 carats in total, and the brooch is set in 18K Canadian white gold. 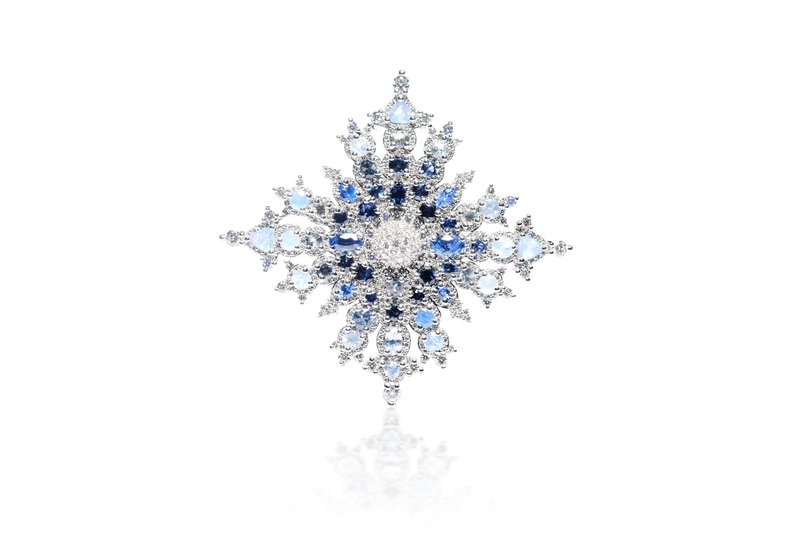 The design, inspired by the Canadian Arctic, is a one-of-a-kind snowflake shaped like the North Star. 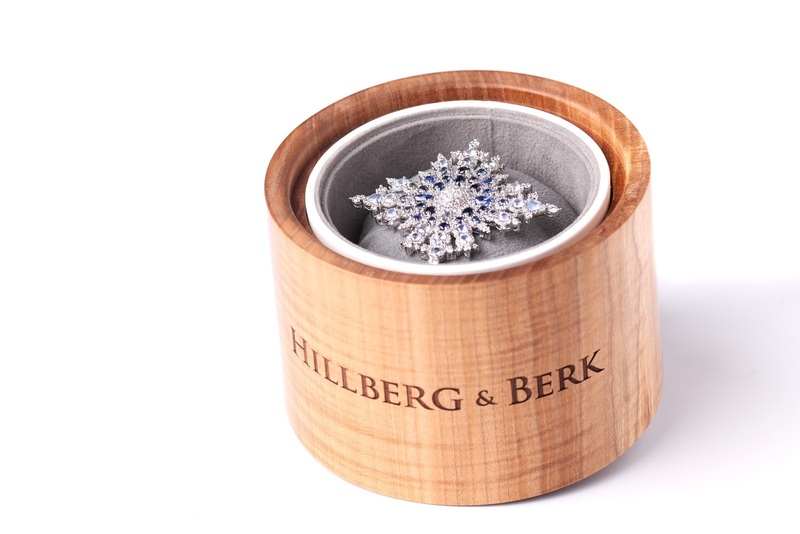 The brooch was designed and crafted by Hillberg & Berk. The Canadian jewelers also created the Saskatchewan Tourmaline Flower Brooch that was gifted to The Queen in 2013. The center diamond dome around which the snowflake is based is a special Hillberg & Berk touch, recalling their signature Sparkle Ball collection. The Sapphire Jubilee Snowflake Brooch measures 61 mm tall and 66 mm wide, or about 2.5 inches square. It's slightly larger than the Maple Leaf Brooch, which is 55 mm x 50 mm, and is right in the size range of The Queen's usual favorite brooches. 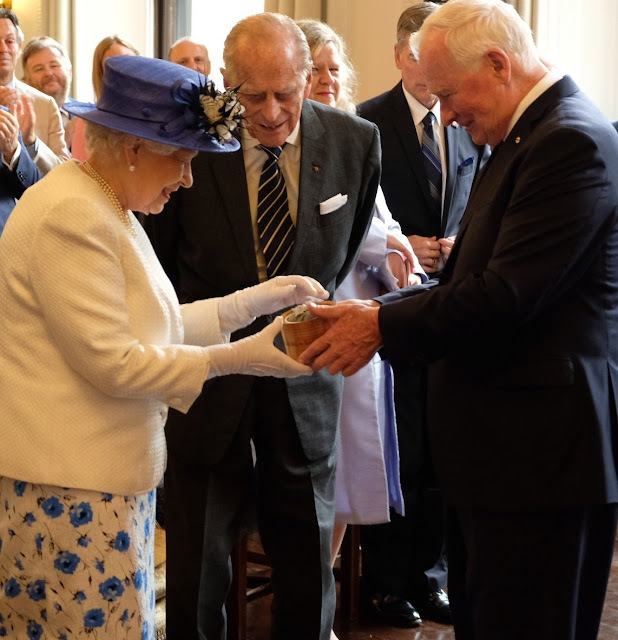 The Queen smiled as she received this stunning brooch in its beautiful wooden box, and waited until the following year to debut it. She has worn her other Hillberg & Berk brooch on several occasions, and I hope she will be just as fond of this one.